Want to Change the World Through Innovation in Engineering? As someone who has worked in Silicon Valley for 20-plus years, you might expect me to tout the computer as the greatest engineering innovation of all time. But even after decades working in the cradle of one of the most significant inventions in history, I still often jump back several centuries when asked what I consider to be the greatest innovation of all time: the printing press. The printing press was instrumental in democratizing and dispersing literacy and knowledge throughout Europe and around the globe. The Gutenberg Bible, created using some of the earliest printing presses, changed the structure of politics and religion around Europe. It was revolutionary. It changed the world. That’s the power of innovation—or, at least, the possibility. 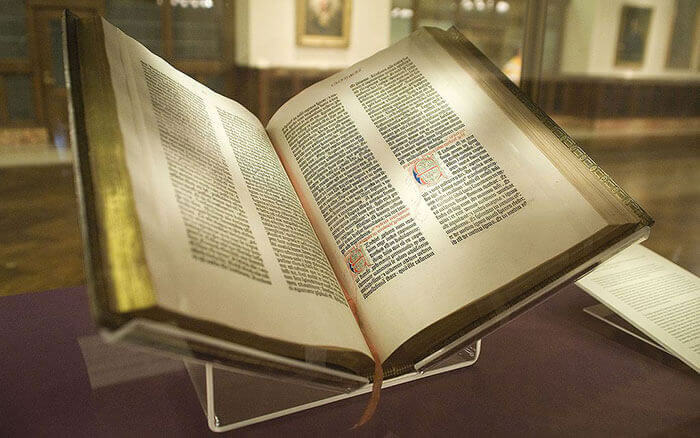 The Gutenberg Bible on display at the New York Public Library. Courtesy NYC Wanderer (Kevin Eng). As an innovation strategist, I have spent years researching the process of innovation, particularly through the development of the Autodesk Innovation Genome. What makes a good idea great? And what makes a great idea world changing? First, you have to understand what innovation is, what it isn’t, and why so many companies seek it so relentlessly but find it so rarely. When I first started studying innovation, most definitions I came across were bad, false, or just fuzzy and amorphous. Innovation was, and is, a little bit like Bigfoot and Elvis—it’s supposed to be everywhere, but it’s incredibly hard to find. Here’s a definition that can actually help companies innovate: Innovation is the art of establishing something in the real world that is new or different and that has a significant impact. If you focus on the “establish in the real world’ part of this definition, it’s much more likely that you will do some real innovation. CEOs always list innovation in the top tier of importance; after all, if a company isn’t constantly seeking to create and reimagine, what is its purpose and how successful is it likely to be? But despite this interest in innovation from the top, companies that aren’t innovating are often scared of being wrong or failing, and those fears ultimately inhibit success. When you think about why organizations can’t innovate, consider the time between the invention of the spear and the bow and arrow: 391,000 years. Why did it take so long for human technology to progress from one mode of warfare to a much better one? If I’m good with a spear (the current way) and you introduce a bow and arrow (a “better way”), I might react negatively because your idea seems dangerous and threatening to my basic understanding of the world. Today’s corporate climate is not that far removed from those bow-and-arrow fears. As a CEO, if an employee comes to you with a very new and different idea, that person can seem like a threat. But you don’t have to see it that way: You can embrace the evolution (or the revolution), be a part of it, and maybe even lead it. You’re there to wow the customer and beat the competition—but to do that, you have to innovate and open up both yourself and the company to change. That’s where a proven innovation methodology can help. In the course of my innovation research, my team and I set out to study the thousand greatest innovations in history. We studied every item on the list, some more closely than others, to systematically define and refine the common means that have led to some of the world’s most revolutionary creations. Ultimately, this exploration—through the Autodesk Innovation Genome—yielded a methodology of five techniques. Create an innovation environment. Think of it like a 30,000-foot-view map of your company, customer, competition, and context—all seen through the lens of innovation. Identify innovation targets. Home in on specific areas where innovation can be usefully applied in your business. Develop innovation ideas. Apply the seven innovation questions (see below) to your targets to start producing a wide range of ideas. Prioritize innovation ideas. Determine which ideas are both wild enough to be truly new and practical enough to achieve. Turn ideas into projects. Often the hardest step for organizations, this is when you formalize the idea, get buy-in from stakeholders, and make it real. See how to integrate innovation into your daily engineering workflow. Look: What could you look at in a new way or from a new perspective? Use: What could you use in a new way or for the first time? Move: What could you move, changing its position in time or space? Interconnect: What could you interconnect differently or for the first time? Alter: What could you alter in terms of design and performance? Make: What could you make that is truly new? Imagine: What could you imagine to create a great experience for someone? For each innovation throughout time, what was the jump from A to B? By studying history, it became clear that genius innovators implicitly or explicitly asked a set of questions about the status quo (the current thing) to get to the status novo (the new thing). I’m not saying Steve Jobs or Benjamin Franklin or Grog the Caveman had these five steps written out, but they’ve all done different versions of this. Think of incremental innovation as your day job. Whatever you’re doing—making an engine, making a restaurant, making a government—make it a little better every day. But beyond that, you should spend some of your day job trying to figure out the next big thing, whether that’s a new way to do something or a new product. That brings me back to that great innovation, the printing press. Consider written language before the printing press: monks and scribes who hand-copied pages for centuries and likely expected centuries more of the same method. But the stamp punch had been around since Roman times, and the wine press wasn’t far behind it. Gutenberg just had the crazy idea to connect the two. One invention, one aha moment, led to one of the most disruptive, revolutionary innovations of human history. That’s the power of innovation. Remember, innovation requires establishing something in the real world. Invention is bringing an idea into existence for the first time, but innovation is taking it out into the world, thereby changing it.